The modern Denva is a comfortable bed with a contemporary appearance. 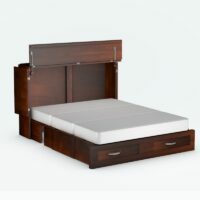 Categories: Cabinet Beds, Finished Furniture, Premium Cabinet Beds Tags: cabinet bed, cabinet beds, denva, fold away bed, fold out bed, folding-bed Brand: Cabinet Bed Inc. 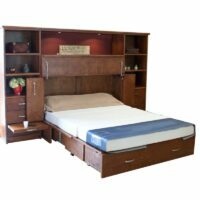 The Denva Cabinet Bed is one of the Premium models from Cabinet Bed, Inc. This contemporary style is available in full or queen size. We refer to the Cabinet bed as the “Eighth Wonder of the World”! 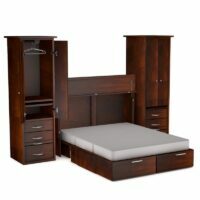 The Cabinet Bed Premium Beds include: The Park Avenue, Town and Country, Metro, and Denva. We include delivery to your home with the purchase of this bed. They are heavy and require 2 people to bring in, unbox and put the top on the base. It will also need leveling, which is simple. The drawer will open easily when the bed is properly leveled. 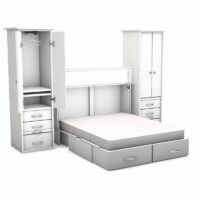 In addition, we offer “White Glove” complete delivery and installation of your bed for a very reasonable price. Consider this option when checking out. 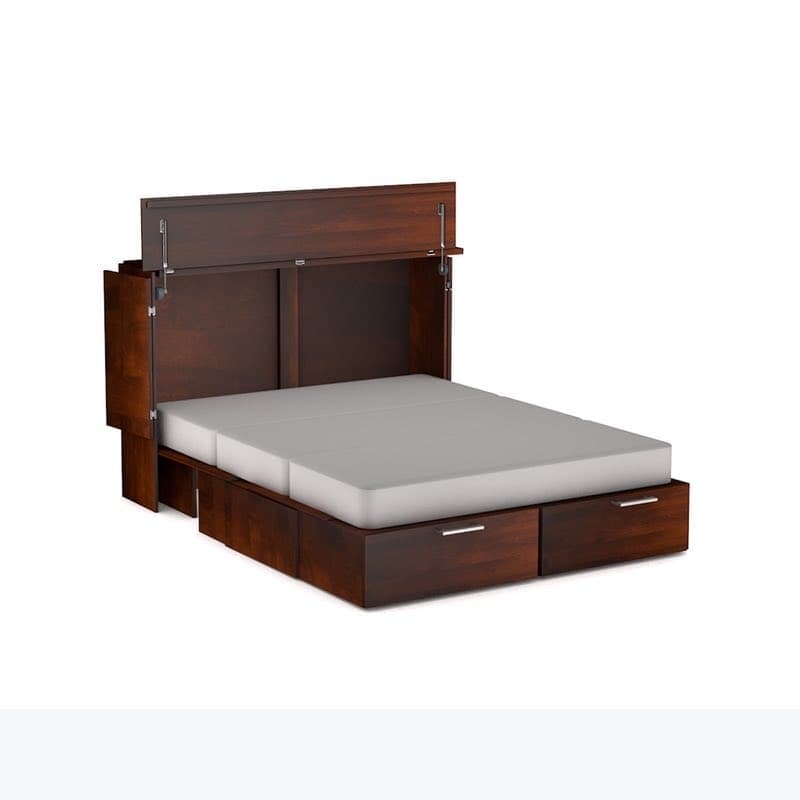 The Denva Cabinet Bed includes a CertiPUR-US® memory foam mattress with a bamboo cover. This cover has a non skid bottom and the cover is both removable and washes beautifully. This fold-out bed is made from all wood in Vancouver, Canada. We are open 7 days a week. Contact our Customer Care team at 512-451-0213 or 210-308-5655 or email to order direct or answer any questions. 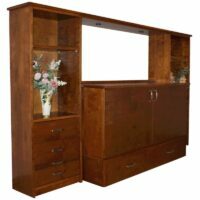 The cabinet is a great TV stand and can support flat screen TV’s up t0 80 inches. The back half of the top remains in place when opening the bed. One person can open the bed in about 30 seconds. Beneath each corner are adjustable levelers, which means regardless of flooring the bed will sit level and the drawer will open and close easily. The sides and top open for a more spacious feeling. 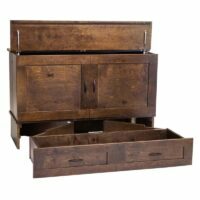 The large drawer is accessible while the bed is open and has plenty of room for blankets, quilts, and pillows and holds up to 500 pounds. Select the best finish for you room decor. Only water based stains and paints are used on this real wood product. Choose from our hardware selections, or use your own 5″ center cabinet pull. The mattress is all certified CertiPUR. When you see the CertiPUR-US® seal, you can be confident that the flexible polyurethane foam inside meets CertiPUR-US® standards for content, emissions, and durability, and has been analyzed by independent, accredited testing laboratories. These beds are made in Canada from real wood and plywood. Furniture makers believe that real wood construction is strongest and most stable. 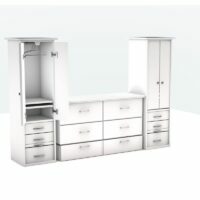 The Cabinet Bed contains no toxic and environmentally harmful MDF or particleboard. Only Canadian and American Lumber is used the making of cabinet beds. 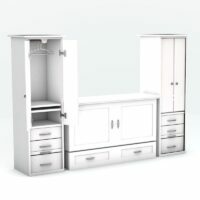 Real wood cabinet beds are also the longest lasting construction mainly because the screws that hold up your door hinges and drawer tracks are securely anchored in the layers of the solid and plywood and won’t loosen or strip. Had a great experience with Johnathon Burlison. Very knowledgeable and helpful throughout the entire purchase process.